I knew what pattern I would be choosing before I even knew I had to be inspired by one: snakeskin. I have no idea why, but I am obsessed with it! I don't think I would ever own a snakeskin top or pants, but maybe booties or a clutch.. maybe.. Tough to say! But I love it on my nails. I didn't do sponging this time like I did the last two times I have done it.. I think I like it better with the sponging - it adds more depth. Before I say anything more.. 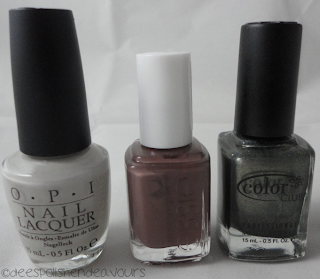 I have to mention that the polish I wanted to show up for this day totally did! Color Club Snakeskin.. REALLY?! 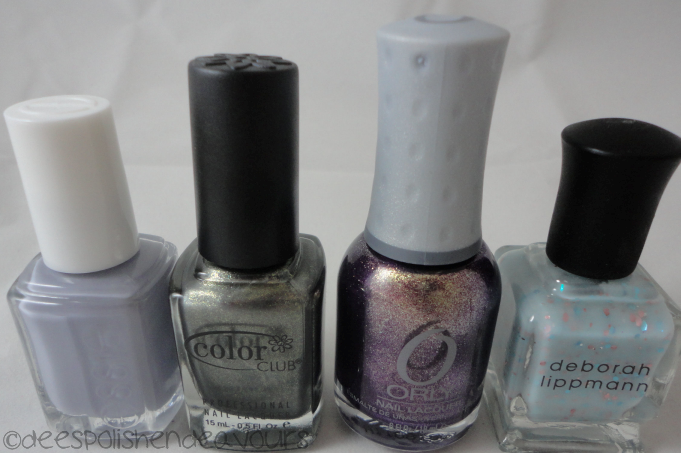 Why did I not own this polish already!? DY-ING! I love it and it was perfect for this particular day. 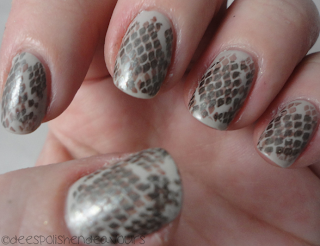 I highly doubt I will ever do a snakeskin mani without using Snakeskin - just sayin'! I started with a base of OPI Skull and Glossbones, then I stamped Essie Mink Muffs first followed by Color Club Snakeskin using BM plate 215. I also wanted to show off my new children: Essie Cocktail Bling, Color Club Snakeskin, Orly Oui and Deborah Lippmann Glitter in the Air. Little upset about Glitter in the Air.. I tried to apply it quickly yesterday (quickly meaning I had an hour to allow my polish to sit..) and after that hour, I was doing my hair and my nails were not dried! WTF?! With my trusty seche vite and all. Grrr!! Welp, see you all tomorrow! !